"New Suicide Squad Vol. 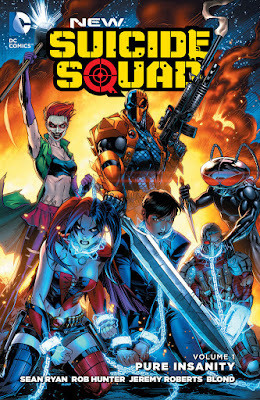 1: Pure Insanity"
I think I was the same as a lot of people, and I wanted to read this graphic novel out of curiosity for the new movie, Suicide Squad, coming out next year. This book, which includes comic books #1-8, was a great way to get a feel for the characters and set up of the film, but I didn't think it all tied together extremely well. I definitely still got caught up in the action, and I became invested in some of the characters so I had to see how it ended. But there were still some holes and disjointedness in the overall story. I would have loved to have gotten to know the characters a little better. Especially the actual Suicide Squad instead of having so much of the narrative devoted to those who pull the strings in the office. I became especially attached to Manta, Harley, and Reverse Flash. I was really pulling for them, and I would have loved seeing more fleshing out of their characters. Joker's Daughter, Deathstroke, and Deadshot were all in and out so fast my head was spinning. They weren't able to add much to the story. I'm sure I will continue this series, because I became invested in the characters. The action was great and kept me turning the pages as fast as I could. But I think I will try to read some of the other incarnations of the Suicide Squad, just to see the story from a different angle. I really liked the idea of the team up of villains, and all of the characters have an interesting story to tell. This one focused just a bit too much on the red tape of the missions instead of the motivation of the characters for me. Bottom Line: This graphic novel is a great primer for the upcoming Suicide Squad film. It's a nice step-off for some interesting characters and a unique premise. Now that I know it all sounds pretty cool!